Matthew: As Kevin rightfully identifies in our podcast, this episode is sort of a rapid-fire sampler of previous Trek tropes. This isn't necessarily a bad thing, but it deserves mention. First, we have the all time classic "Cause and Effect," with its recurring time loops. Janeway and Chakotay are killed, their shuttle is destroyed, then they're alive again, and so on. Then, things shift a bit and we get shades of "Remember Me" and "Whispers," when no one seems to agree with Janeway on her perceptions of reality. I love some of the turns these vignettes take, especially when the Doctor "euthanizes" Janeway. Eventually the mystery fades away and we get to the story proper, a being trying to guide Janeway into the afterlife. We'll discuss that below, but I will say that the connection between these two portions of the story is somewhat mystifying. 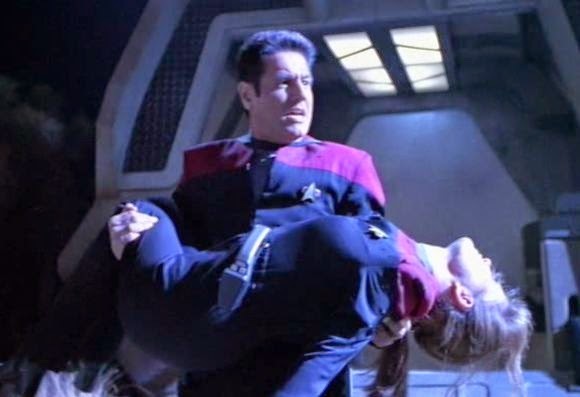 Is each vignette an attempt by the being to get Janeway to accept death? If so, why are they so violent? It seems like the soul sucker could create a pleasant fantasy to convince her to go along. Instead, are they projections of Janeway's own mind? Kevin: I enjoyed the scenes in and of themselves. The talent show banter was some nice, organic dialogue. My only complaint overall is that by delaying us getting to the meat of the story, we lose time to explore it. The character notes struck by the vignettes are solid enough that I largely enjoy rather than am annoyed by the TNG callbacks. This far in, I imagine it has to be a challenge to write one that wouldn't do that is some way. I will add, though, that I think the episode tipped its hand a tad early on the un-reality of the visions. The choking was surprisingly graphic for Trek, and the euthanasia scene, while entertaining, was so out of character that it flags to the viewer something more is up than a time loop. Matthew: I don't mind what I agree is the obvious un-reality. It makes things weirder for the viewer, trying to suss out the real solution. Anyway, the ultimate soul sucker story affords us some nice opportunities. For one, we get to meet Janeway's father, and see her deal with the emotional repercussions of his untimely death. I would have liked more story detail about his death, but the continuity we do get humanizes Janeway quite a bit and makes her feel very real. Then of course we have a funeral scene, and those are always ripe for drama. I would say B'Elanna's is the best speech, showing us her character's growth... EXCEPT that these vignettes take place in Janeway's mind, so we're not really learning about the other characters, but about Janeway. I'm okay with this - it's interesting to see how Janeway hopes she will be eulogized, what memories she finds important or integral. There is also a nice creepy feel, reminiscent of "The Next Phase," in which Janeway is an immaterial ghost. All in all, some nice atmospheric moments all around. Kevin: I lived the callbacks to Jeri Taylor's novel Mosaic. It's essentially the character bible for Janeway turned into fiction, and this episode prompted me re-reading it. It definitely holds up. If anything, I wish the episode had mined more of it. In the novel, Janeway is on the ship with her father and fiance when it crashes and trying to beam them both to safety loses them both. It's a wrenching scene in the novel, and it would have been fun to watch Mulgrew relay that story. Still, we get buckets of nice character moments that even for the subjectivity Matt points out, still sing from an entertainment perspective. Matthew: The ultimate "solution" is that the soul sucker entity is trying to hornswaggle Janeway into entering his realm for his nourishment. Now, look. I dislike talk on Trek of neural energy, or disembodied consciousness, for various philosophical reasons. But I can set them aside if the story works. I do think it largely works here, albeit with a few minor caveats. Why must one enter into this creature's realm voluntarily? How does such a being or set of beings propagate, knowing where and when a conscious being is "at the moment of death?" Nonetheless, I enjoyed Janeway's showdown with the being, and I really liked that the episode at least asked whether this type of creature could be responsible for near death experiences generally. Kevin: I think this episode lost a little by making the vision of her father so immediately and obviously wrong. There's a great undercurrent to hero stories that can explore the notion that hero secretly wants to stop being the hero. The idea of going along could have some appeal on that basis. What if instead of constantly fighting for every little thing and dealing with the guilt of being responsible for stranding the crew, Janeway could just....let go. Spend eternity with a beloved father, free from worry. It would have given us a fun moment of genuine indecision. Matthew: Kate Mulgrew is the star of this one, and she earns her paycheck. She does a good job in the "are we in a time loop" role, but then switches into the gear of the departed soul quite ably. Her tears upon her crew's eulogies were real and involving.She also had a really nice rapport with Robert Beltran, which again raises the question of why they didn't just let these two actors consummate their characters on screen. Kevin: Yeah, those shuttle scenes were really nice and understated. It's one of an unfortunately few number of times I bough Chakotay as a character and the two as a command team. But back to Mulgrew: yep, she's still awesome. Matthew: The other main crew standouts for me are Robert Picardo and Roxann Dawson. Picardo was totally creepy as he was euthanizing Janeway, and I love it when he gets to inject that dark note into the character. Dawson delivered the best of the eulogies, for me. Kevin: I really liked her speech as well. It felt as if Dawson was really mining the character history and not just "acting." I'm sad Tuvok did not get some scene of portraying Vulcan grief. It would have really interesting. Matthew: Len Cariou did a nice job as Admiral Janeway and the soul sucker. I do think the script didn't give him enough in the way of "nice" scenes, and made him go villainous a bit quick, but either way the actor sold it. Kevin: I would have like some more scenes that established his bona fides as a father. Admiral Janeway makes passing reference to raising Kathryn as a scientist, and again, the book would have been a great source for more scenes, but some showing us of their bond would have upped the emotional stakes. Matthew: The shuttle interior was typically excellent - I love that wide window for visual drama and camera moves. The exterior space shots were not as impressive. I know the shuttle is not supposed to move aerodynamically, but they way the do the movement effects just seems "off." The planet and cave sets weren't the worst of their kind, as they were well lit. But they weren't real standouts. Kevin: I would describe all of those as "adequate." It's not an effects episode, though. I did like the early onset phage make-up. That was super icky. Matthew: The energy effects in the various firefights were competent. 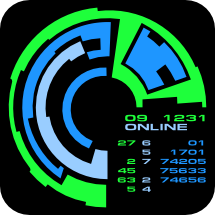 The anomaly, which appeared both in space and on the ship, was a re-use of the anti-time anomaly from "All Good Things." It looked fine, but I wish they would have shown us more of the soul sucker's "matrix." Kevin: The color choices felt a little on the nose, didn't they? Matthew: Although I think this was lacking ambition in a few spots, and the story was a tad disjointed, the individual vignettes really entertained me. Combined with some very nice performances, I think this squeaks into 4 territory. Kevin: This gets a 4 from me as well, for a total of 8. I think I would have given this a 4 largely on the strength of Mulgrew's performance. Jettisoning some of the early stuff to really dig into the philosophical meat of the story would have given this an easy shot a 5.